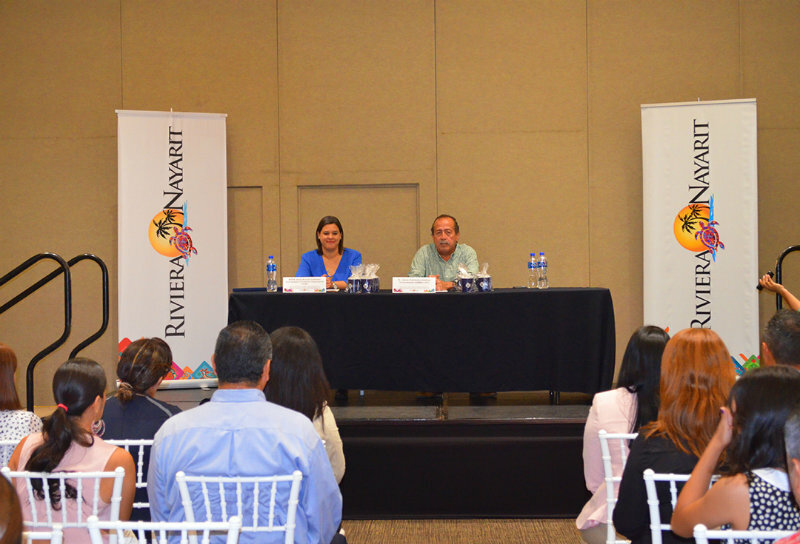 The certification program is part of the professionalization endeavors led by the Bahia de Banderas Hotel and Motel Association (AHMBB) together with the Riviera Nayarit Convention and Visitors Bureau (CVB). Over twenty people who work with the Riviera Nayarit hotels satisfactorily completed the Management Development and Decision Making Certification Program held over the past eight months under the guidance of instructors from the ITESO Jesuit University. This is part of the commitment the Bahia de Banderas Hotel and Motel Association (AHMBB) has with its associates in coordination with the Partner Services and Tourism Development Programs desk of the Riviera Nayarit Convention and Visitors Bureau, via its Safety and Human Resources committees. 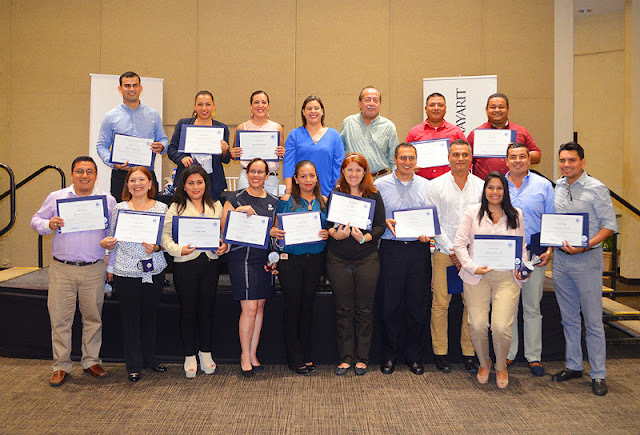 Twenty-one managers and assistant managers received their diplomas during an event held on Saturday, October 7 at the Villa del Palmar Flamingos hotel. Each of them had satisfactorily finished the seven modules in the Certification Program, which was held Fridays and Saturdays from March through October of 2017. During those eight months the group covered different topics including: Systematic Vision and Strategic Thinking; Emotional Intelligence; Self-Diagnosis and Recognition; Managing Stress, Communication and the Brain as a Basis for Decision-Making; Negotiation and Conflict Resolution and Teamwork; Leadership and the Development of Human Capital; and Human Behavior Analysis Techniques. Jesus Carmona, Vice President of the AHMBB, spoke on behalf of the hotel union and congratulated the group of graduates for having reached such an important goal in their personal trajectories, which reflects their wish for personal advancement and the improvement of their abilities in order to offer a better service to the tourist. “One of the topics we’ve espoused in the Hotel Association is training on all levels in order to improve the hotel sector, offer better service to our visitors and maintain the different departments on a good level. Until now we’ve had a very positive response on behalf of the hotels and the personnel they’ve sent in. “We know we still have a lot of work ahead of us, it’s never-ending; there’s a lot of competition out there and we have to be at a very good level. However, the human factor has a lot to do with it and I can assert that the one we have in this region is top notch,” he said. Meanwhile, Professor Asela Burgos Campero, Business Training Coordinator at the ITESO Jesuit University in Guadalajara, pointed out that the main engine of change is not only within the topics offered in the certification program, but in the questions the graduates must ask themselves in order to put their new knowledge into play: “it’s not only about the ‘why,’ but it’s also about the ‘for what,’ which is, in the end, what will propel them into the future,” she commented. Participating hotels included: Four Seasons Resort Punta Mita, The St. Regis Punta Mita Resort, Vallarta Gardens, Grand Velas Riviera Nayarit, Villa del Palmar, Rancho Banderas, Vidanta, Dreams Villamagna and Desarrollo Punta Mita. Juan Manuel Adoño Cortez, Manuel Francisco Camba Pérez, Ciro Enrique Contreras García, Miriam Lizett de Haro González, Itzel Hurtado Castañeda, Ana Cleotilde Junco Piñero, Sindy Karla López González, Héctor López Pérez. Asimismo Zaida Denise Magallanes Valle, Neftalí Ortiz Gallo, Miguel Ángel Piña Molina, Filiberta Ramírez Cázarez, Ana Imelda Reyes Ramírez, Jorge Ríos Guerra, Elmy Karem Ruelas Gastélum, Julio Enrique Valencia García, Jorge Alberto Vázquez Martínez, Sergio Alberto Jiménez Franco, Claudia Esther López Jaimes, Athziri Martínez, and Alejandro Romero García. The Partner Services and Tourism Development Programs desk has already coordinated 4 certification programs for associated hotel personnel, benefiting 90 associates and helping to improve the quality of tourist services.